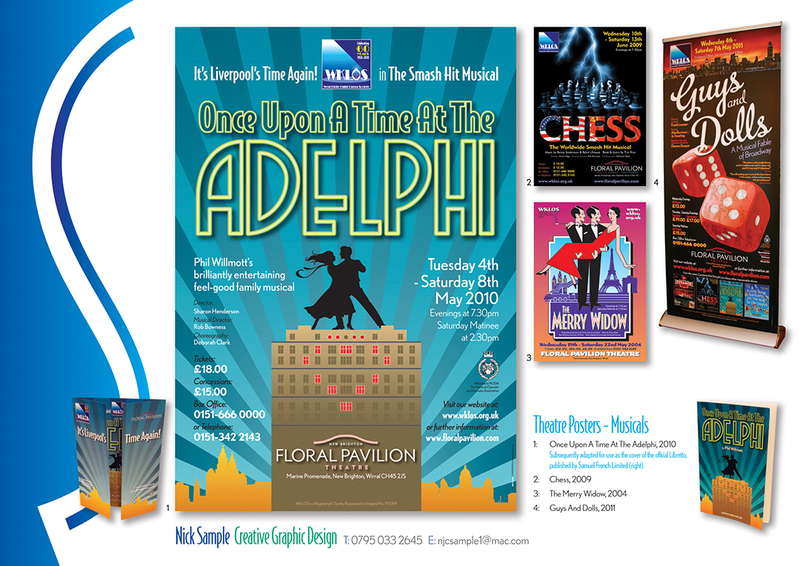 Having previously worked in Theatre, Nick has been designing publicity campaigns, Posters, Leaflets and Souvenir Programmes for a huge range of shows for over 25 years. From Musicals to Shakespeare, straight drama and thrillers to comedies and farces, variety shows to one-night stands & concerts, Nick's design work has covered almost every genre. Recent commissions have included work for Hillbark Players' 2013 production of "The Merchant Of Venice", the Souvenir Programme for the 2013 cycle of The Chester Mystery Plays, and the 2013-14 Season Posters and Corporate Brochures for both Wrexham Grove Park Theatre and Chester Forum Studio Theatre. In 2012 Nick's design for the world non-professional premiere of Phil Willmott's musical "Once Upon A Time At The Adelphi" was, at the author's request, adapted to feature on the cover of the official libretto, published by Samuel French Limited. "Just seen the first print of 'Adelphi'. The cover looks beautiful! Thankyou so much". Phil Willmott, Playwright. Please click on the submenus on the left to view more examples of Nick's theatrical work.